All hail the off-road electric 2-wheeler! 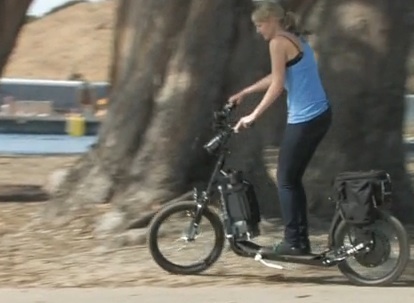 Using basic bicycle parts, a hub motor, and a battery pack, Diggler’s electric scooters can go 20-miles on a charge, and are being used by off-road and on-road enthusiasts to travel locally without pedal-power or a gas engine. Unlike with Onya Cycles or Fortune Hanebrink, Diggler scooters don’t have pedals, so I was standing up while throttling around during our test drive for this week’s Green Overdrive. But after a couple awkward minutes, I found it pretty easy to ride.